Words and letters do not reach it – one should quickly fasten one’s eye upon it. one should overturn the waters and knock down the mountains. Is there anyone in the assembly who can capture it? To test, I cite this, look! If you bark out at the white clouds, the empty sky is smashed like powder. Solemnly executing the absolute command is only a half of the true presentation. If the great activity manifests itself completely, how do you express it? Nanquan one day saw the monks of the Eastern and Western halls quarreling over a cat. He held up the cat and said, "If you can give an answer, I will not kill it." Nanquan cut the cat in two. It's not just today that they're haggling together. This is a case of degeneracy. When the true imperative goes into effect, the ten directions are subdued. This old felow has the capability to distinguish dragons from snakes. What a pity to let him go. A bunch of lacquer tubs -- what are they worth? Phoney Zen followers are as plentiful as hemp and millet. How quick! How quick! If he hadn't acted like this, they would all be fellows playing with a mud ball. He draws the bow after the thief has gone. Already this is secondary; he should have been hit before he even picked it up. People on an eye level don't speak, water on an even level doesn't flow. Who dares stand up to his blade? Wait till rain douses your head. Once drawn, the sword is not sheathed. This kind of haggling continues right up to the present day. A drawn sword immediately creates an acute imperative for action. Poor cat. Its life is in the hands of a bunch of phony Zen practitioners. The sword of wisdom directly cuts, no-cut. In the evening, when Zhaozhou came back, Nanquan told him of the incident. Zhaozhou took off his sandal, put it on his head, and walked off. Nanquan said, "If you had been there, I could have saved the cat." Stirring up smoke and dust, they were helpless to cope. His deeds squared with his words. One knife cutting in two pieces, no matter if lopsided. Old Teacher Nanquan was able to show up true and false. For a thousand ages he makes people admire an adept. This path has not perished. How will you answer? Can you say, "Don't worry, the cat is already cut in tow; there is no need to use the knife; give it to me"? What is the cat? It is your own ego. If you get rid of your ego's demands, there is no dread, no anger, no fear of death. "Cut the cat in two" implies a decisive, determined action. Nanquan was indifferent to who was right, who wrong, and indifferent to all possible criticism. Nanquan is always in samadhi. When killing, he is really killing; when releasing, he is really releasing. However, at the last moment he must have put down the cat. If I were Nanquan I should say, "If you answer, I will kill it; if you don't answer, I will kill it." If I were the monks, I should say, "We cannot answer; please cut the cat in two." Or I should say, "The master knows how to cut it into two pieces, but he does not know how to cut it into one piece." If I were Nanquan and the monks could find no answer, I should say, "You could not answer," and put down the cat. Holding up the cat, one, two, three! If you cut it, there is the iron hammer with no hole. A clean cut, and there’s the cat’s skin running away. The monks from the east and west sectors had gathered together one day and were in a heated argument. There has been much speculation from times of old as to what they were arguing about. 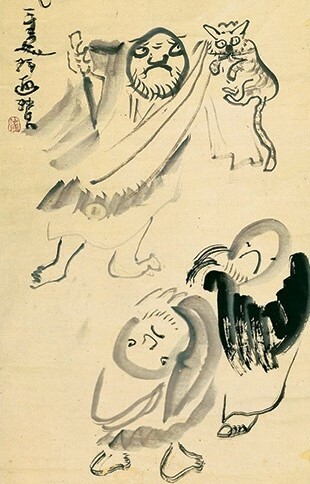 Yasutani sees them as concerned with the most basic question of Buddhism, namely, “does a cat have a Buddha-nature?” Nanquan, evidently observing all this from afar, must have been muttering under his breath about “these good-for-nothing monks.” The case presents us with two problems. First, what is the cat after all? Second, did Nanquan actually cut the cat in two? 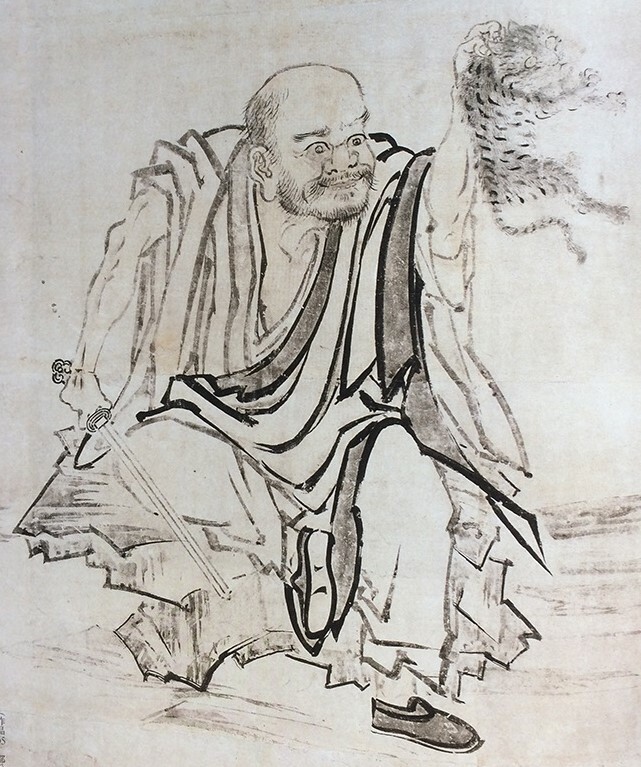 Harada takes the cat to be all the collected junk in our own heads, all the thoughts and wonderings about whether a cat has Buddha nature and the like. Thus, Nanquan is cutting through all those concepts and presenting the truth. Yasutani agrees that the cat is conceptual thought, but sees Nanquan as cutting off the root of all those concepts. According to Yasutani, Nanquan did not actually cut the cat in two. 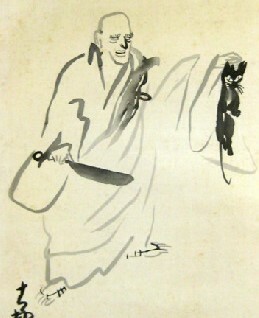 He might have held the cat before the monks and looked like he was going to kill it. But he merely made a gesture of slashing with the knife and then let the cat go. 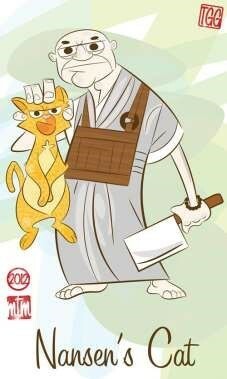 If Nanquan actually killed the cat he would be guilty of breaking one of the Buddhist precepts. 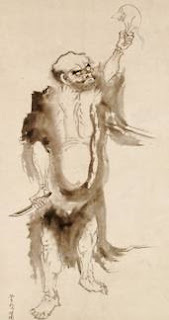 These various interpretations are attempts to take the blame away from Nanquan for his action. Iida Tôin says, “Do you think there is time here to talk nonsense about breaking precepts?” This is yet another way of viewing the koan. From the essential standpoint there is no death. If the idea that there can be killing should flash even momentarily through our heads, we have already broken the precept. 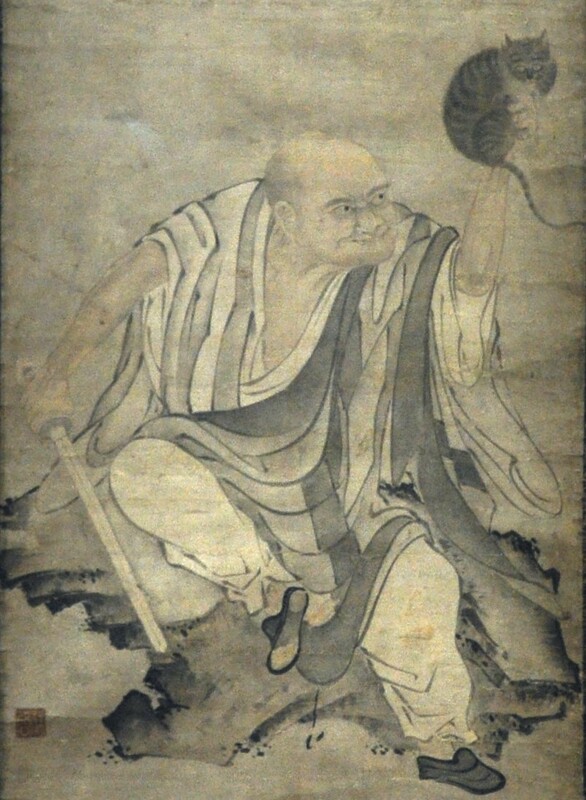 Nanquan did what he did out of his feeling of compassion for the monks, wishing to somehow rid them of their delusions. His purpose was not killing the cat. But I prefer to see the action of holding up the cat as presenting essential nature. That very action of holding up the cat is essential nature itself. By cutting the cat in two, Nanquan has deprived the monks of all their cherished notions and concepts about Buddha-nature. In the resolution of conflict, one can turn to council, the law, or the dharma. Council and law are dependent upon the power of others, the dharma is based on one's own natural powers of equanimity. Nanquan does not turn to forgiveness, encouragement, reprimand, or chastisement. He simply holds up the whole community at the edge of his diamond sword. This koan is not about killing or not killing but, rather, about transformation. An ancient sage said, "When you find yourself at an impasse, change; when you change, then you will easily pass through." No one in the assembly can see past the thickness of their own skin. Master Nanquan, with his fearless challenge of life and death, is trying to bring his disciples to the reality of the moment. Nanquan is begging his disciples to say one word to save the cat -- but they're paralyzed, dumbfounded. As long as there's a trace of self-grasping ignorance, you would not be able to do it. Hundreds and thousands of animals are killed every day, but none of these deaths is a sacrifice for our liberation. 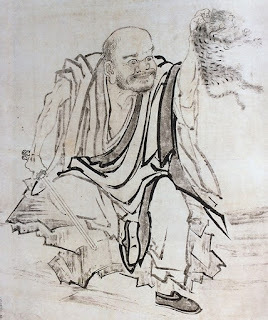 Nanquan sacrificed the life of one cat for the liberation of hundreds of millions of beings. He also was willing to sacrifice himself and accept whatever karma might have come from that act. Speak, or it will die! When you can't explain, then you must cry. Where you can't speak, there you must look. The right word would have saved the cat. That time no one really died. too quick, or not quick enough. The kitten run over on the line in the road. A casualty, an answer, a tear. Cut it in two. Cut it in one. Present your delusions. Present essential nature.